It’s been a long time since I got so positively surprised about a restaurant. Yesterday Carol and I had lunch at Franco Manca, a pizza place with branches in Brixton and Chiswick. This is now my favourite pizza place in London! I heard about it from Marco and ended up reading a few reviews in Yelp. 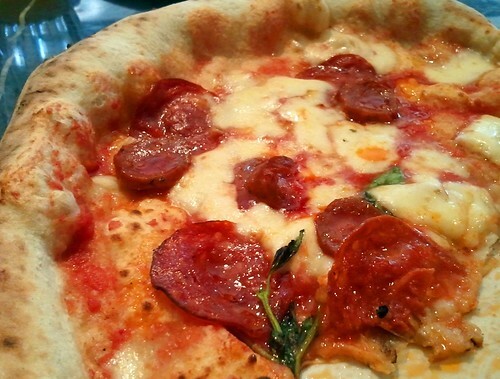 Their pizza is made from slow-rising sourdough baked in a especial type of wood-burning brick oven called Tufae. What does it mean in practice? The dough alone is very tasty and light! For instance, we had garlic bread as starter. The garlic bread is pretty much their baked sourdough with a simple topping: a bit of tomato sauce, olive oil and chunks of garlic. Because the dough is so good, they don’t need a massive topping to make it tasty. Same applies to the pizzas. Impressive. The menu is very simple. They offer only 6 pizzas and around 5 starters. The owners seem to be very strict about the ingredients they use in the pizzas. The cheese, meat, and tomatoes all come from trusted organic suppliers. It’s an affordable menu overall — if you compare with, say, Pizza Express — with pizza prices ranging from £6 to £8. In terms of drinks, they serve a delicious organic lemonade with honey! I strongly recommend it! I also had a bottle of an Italian naturally-sparkling water called Ferrarelle. Refreshing one. To make it all even better: their espresso is made with Monmouth coffee, my favourite coffee shop in London! I found some very good pizza places in London but none of them were outstanding. Franco Manca is a simple and affordable restaurant serving the best pizza in London in my opinion.